The best belated birthday wishes have the right mix of sincerity, remorse and humor to make the people you love feel special, even if you missed their birthday. Striking this perfect balance is what makes the belated birthday messages on this page the very best you can send someone. 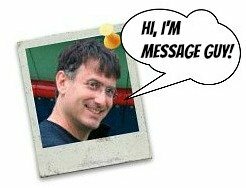 If you need a few tips to choose the ideal belated birthday greetings for your situation before you actually pick one, all you need to do is take a few minutes to check out Message Guy's Tip #88 right below. 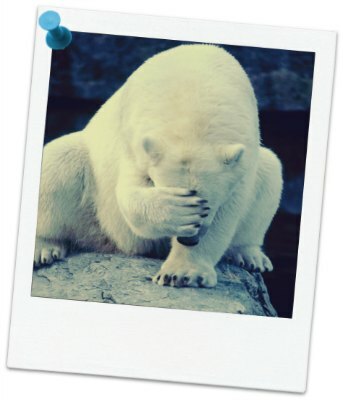 Forgetting somebody’s birthday can make you feel a little embarrassed. Worse, your family or friends may think you don’t care about them enough to remember their special day. They may even be mad at you for forgetting it. ...Should your belated birthday greeting be serious? Should it be apologetic? That depends on your recipients — and if they are actually angry with you for forgetting their birthday. If birthday boy or girl has a good sense of humor and is not mad at you for your forgetfulness, go the funny route with the belated birthday message you choose. If birthday boy or girl has a good sense of humor but is slightly mad at you for your forgetfulness, you should still go the funny route and be a little bit apologetic with your birthday wish. If birthday boy or girl has a sense of humor but is very mad at you, skip the funny route altogether (not even a little bit humorous) and take the serious, apologetic path. If birthday boy or girl has no sense of humor and is slightly angry or not mad at all at you, take the serious, apologetic path. If birthday boy or girl has no sense of humor and is very mad at you, go straight to the serious, apologetic path (and hope for the best). That's not all you should consider when you choose a belated birthday greeting. You should also think about grammar. Yes, grammar. Most people are not aware of the fact that "happy belated birthday" is grammatically incorrect, so you won't see it on this page (or this site). "Belated birthday wishes" or "Here's a belated happy birthday" (or a variation of these expressions) are correct, though. To find out why, read a very short grammarist.com article on this very subject. Ultimately, your goal is to rectify the situation and make the birthday boy or girl feel just as special as he or she would have felt had you sent your birthday wish on time (or more special, if you're really ambitious with your belated birthday wishes). Hope you had a happy birthday. Yes, I missed your special day by a mile, but I think that this birthday message will make you smile — or am I just in denial. Hope you had a wonderful birthday. I'm a little late, so I hope you're on the "better late than never" team. Yaaaaay, late team! Hope you had a happy birthday! There's no excuse for how late I am with your birthday message, but you know I can make one up if I had to. Although I lost my mind for all 24 hours of your birthday and forgot to wish "happy birthday" to you, I hope you'll accept a "belated happy birthday" now as a down payment for a BIG, BIG, BIG birthday hug. It’s apparent that you have been blessed with many things on your birthday. Unfortunately, a punctual birthday message from me was not one of them. Hope you had an amazing day! 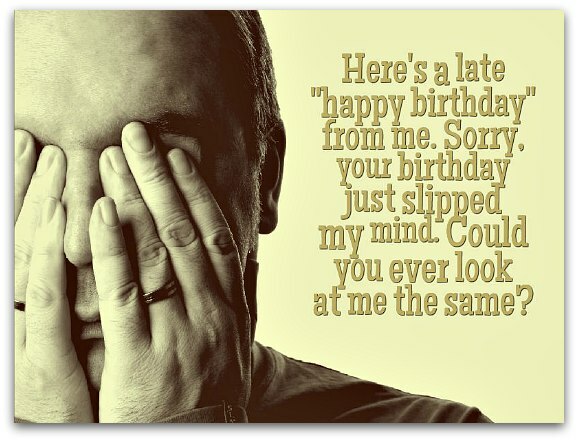 The birthday message's play on words and apology are done in a way that humorously and properly addresses the whole issue of forgetting the birthday of someone special...without being heavy handed (which can make the birthday boy or girl feel uncomfortable instead of special). I would send this one in a heartbeat. A real friend takes you drinking on your birthday to make you forget your age. I forgot your birthday but we can still go drinking to forget I forgot it. Wishing you a belated happy birthday! I didn't really forget your special day — I just figured you deserved more than one this year. Hope you had a terrific birthday! Hope you had an unbelieveable birthday. For me, it's almost impossible to remember your special day. No matter what age you turn, you don't look a day over your last birthday. Hope you had a truly special birthday. I know I missed your special day but, as far as I'm concerned, every day of the year is special because you were born. Wishing you a belated happy birthday! Although I'm late with my birthday message this year, please know I wish you well all year-round. I'm so sorry I missed your birthday. I must have lost my head or something. Hope you had a truly special day anyway. I'm very sorry about forgetting your special day, so please accept this belated birthday wish in the spirit it is given. Hope your birthday was incredible...just like you. I'm very sorry I'm so late with your birthday wish. Hope you had a wonderfully special birthday all the same! Want to keep celebrating your birthday? 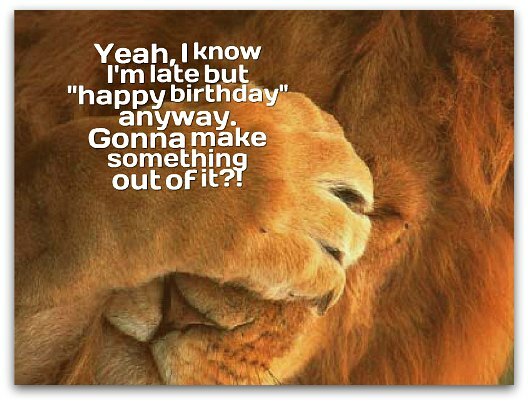 I hope so...because here's another birthday wish to add to your Facebook page: Happy birthday!